A few people have asked me about seat upholstery. It's one of the most notable and admired features of the car. I'm no expert on upholstery- that's my wife Ann! In order to help you upholster your seats I've provided measurements, sources and hints from her which will help you to complete the job. Make the entire seat cover as a sleeve; then pull over the frame. 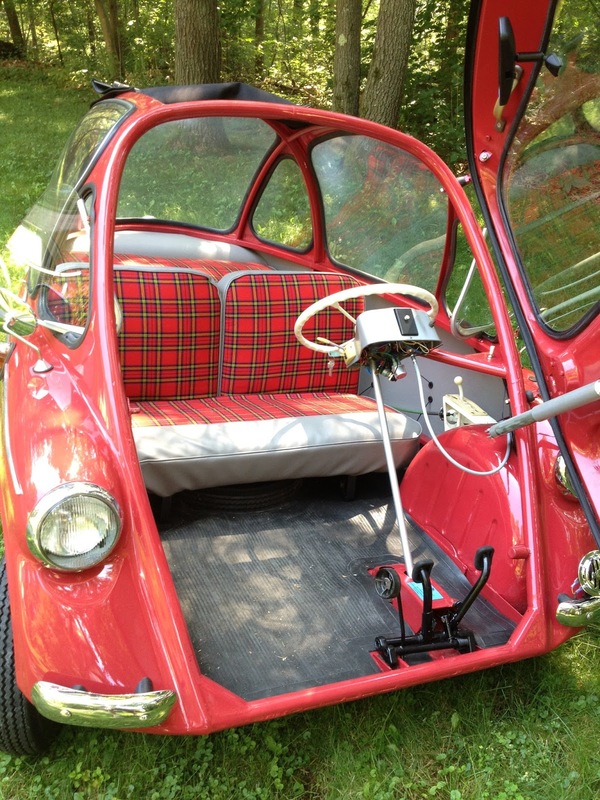 This requires more sewing and cutting, but keeps the cushion from sliding forward while driving. We used 2" high density foam, which makes the seat much more comfortable to sit on. It does make the seat backs a tight fit and a little harder to fold forward, but I don't have any little kids trying to get into the back of my car. On the seat bottom my wife sewed a channel and we inserted a 3/16" steel rod. We then attached the rod to the seat frame with zip ties. This gave us more control and flexibility than we would have had with hog rings. 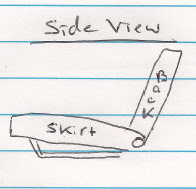 You should add extra fabric to the seat bottom as it pulls around the back and underneath. I did the same thing with the rod and zip ties. 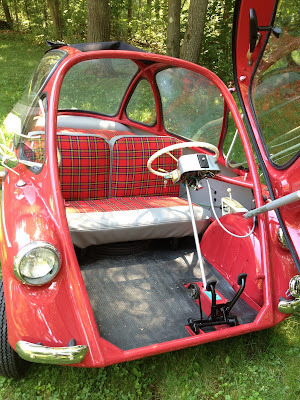 Speaking of top fabric, I was searching on one of my favorite blogs (http://bzisettas.blogspot.com/), and he had a source for plaid fabric:http://www.gowesty.com/ec_view_details.php?id=3777&category_id=&category_parent_id=. For those not in the US, this site specializes in VW camper restoration supplies. Of course you can also get fabric from Nick Haddon at the UK Heinkel-Trojan club. All piping was made from vinyl material wrapped around a 1/8' diameter piece of cording. See the picture below. We attached the base underlying fabric (the rubberized stuff between the springs and the foam with some little clips that go around a lip on the seat made for this purpose. There's a picture of them below, I don't know what they are called. When attaching the fabric to the seat back you need a 3/4' or so round clip that attaches all together. Also, the back had a cardboard insert the fits into the seat frame. We suggest you make an entire set out of an old sheet as a test run. This way you can refine your measurements and not risk accidental cutting of the top fabric. 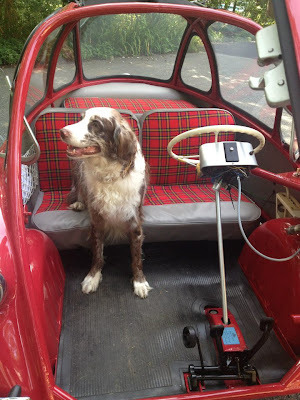 Heinkel Seats- a favorite of dogs all over the world!